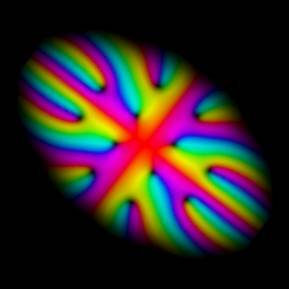 Vortices in a Bose-Einstein condensate. Trying to score at next week’s dinner party? Here’s how to intimidate your boss by fluently speaking quantum. It’s not like some things are quantum mechanical and other things are not. Everything obeys the same laws of quantum mechanics – it’s just that quantum effects of large objects are very hard to notice. This is why quantum mechanics was a latecomer in theoretical physics: It wasn’t until physicists had to explain why electrons sit on shells around the atomic nucleus that quantum mechanics became necessary to make accurate predictions. “Quanta” are discrete chunks, but not everything becomes chunky on short scales. Electromagnetic waves are made of quanta called “photons,” so the waves can be thought of as a discretized. And electron shells around the atomic nucleus can only have certain discrete radii. But other particle properties do not become discrete even in a quantum theory. The position of electrons in the conducting band of a metal for example is not discrete – the electron can occupy any place within the band. And the energy values of the photons that make up electromagnetic waves are not discrete either. For this reason, quantizing gravity – should we finally succeed at it – also does not necessarily mean that space and time have to be made discrete. Nowhere in quantum mechanics is information ever transmitted non-locally, so that it jumps over a stretch of space without having to go through all places in between. Entanglement is itself non-local, but it doesn’t do any action – it is a correlation that is not connected to non-local transfer of information or any other observable. It was a great confusion in the early days of quantum mechanics, but we know today that the theory can be made perfectly compatible with Einstein’s theory of Special Relativity in which information cannot be transferred faster than the speed of light. It’s not like quantum mechanics is yesterday’s news. True, the theory originated more than a century ago. But many aspects of it became testable only with modern technology. Quantum optics, quantum information, quantum computing, quantum cryptography, quantum thermodynamics, and quantum metrology are all recently formed and presently very active research areas. With the new technology, also interest in the foundations of quantum mechanics has been reignited. Contrary to popular opinion, Einstein was not a quantum mechanics denier. He couldn’t possibly be – the theory was so successful early on that no serious scientist could dismiss it. Einstein instead argued that the theory was incomplete, and believed the inherent randomness of quantum processes must have a deeper explanation. It was not that he thought the randomness was wrong, he just thought that this wasn’t the end of the story. For an excellent clarification of Einstein’s views on quantum mechanics, I recommend George Musser’s article “What Einstein Really Thought about Quantum Mechanics” (paywalled, sorry). The central postulate of quantum mechanics is that there are pairs of observables that cannot simultaneously be measured, like for example the position and momentum of a particle. These pairs are called “conjugate variables,” and the impossibility to measure both their values precisely is what makes all the difference between a quantized and a non-quantized theory. In quantum mechanics, this uncertainty is fundamental, not due to experimental shortcomings. We do not normally observe quantum effects on long distances because the necessary correlations are very fragile. Treat them carefully enough however, and quantum effects can persist over long distances. Photons have for example been entangled over separations as much as several hundreds of kilometer. And in Bose-Einstein condensates, up to several million of atoms have been brought into one coherent quantum state. Some researchers even believe that dark matter has quantum effects which span through whole galaxies. In quantum mechanics, every particle is also a wave and every wave is also a particle. The effects of quantum mechanics become very pronounced once one observes a particle on distances that are comparable to the associated wavelength. This is why atomic and subatomic physics cannot be understood without quantum mechanics, whereas planetary orbits are entirely unaffected by quantum behavior. 10. Schrödinger’s cat is dead. Or alive. But not both. It was not well-understood in the early days of quantum mechanics, but the quantum behavior of macroscopic objects decays very rapidly. This “decoherence” is due to constant interactions with the environment which are, in relatively warm and dense places like those necessary for life, impossible to avoid. Bringing large objects into superpositions of two different states is therefore extremely difficult and the superposition fades rapidly. The heaviest object that has so far been brought into a superposition of locations is a carbon-60 molecule, and it has been proposed to do this experiment also for viruses or even heavier creatures like bacteria. Thus, the paradox that Schrödinger’s cat once raised – the transfer of a quantum superposition (the decaying atom) to a large object (the cat) – has been resolved. We now understand that while small things like atoms can exist in superpositions for extended amounts of time, a large object would settle extremely rapidly in one particular state. That’s why we never see cats that are both dead and alive. Your statement "quantizing gravity – should we finally succeed at it – also does not necessarily mean that space and time have to be made discrete." Then, what is the motivation for trying to discretize space-time? Does it help in any other situation? Yes, exactly. Discretization is a good way to tame infinities. As long as you sum up a finite amount of finite things, you will get a finite answer.
" As long as you sum up a finite amount [number?] of finite things, you will get a finite answer." Black hole formation? "physicists had to explain why electrons sit on shells around the atomic nucleus" 1920s QM said methane was CH_2 with a 90° H-C-H angle. Methane is tetrahedral CH_4 with arccos(-1/3) H-C-H. Organic chemistry is jury-rigged LCAO. "Foldit" is a game. Classical general relativity and non-classical competitors assume something not exactly empirically true. The boojum will offend both exhaustive theory and incomplete observation - and be unfundable. All pursued Equivalence Principle tests are guaranteed failures (Einstein's elevator). Physics denies geometric chirality (e.g., Green's function). Geometric tests of spacetime geometry contradict theory. Hello, boojum. I was trying to explain Schrödinger’s cat to my teenage son couple of days ago and he asked what would happen if we put a box around the box - would the cat be still dead and alive. I think his intuition about decoherence was right. It is true that cat becomes quickly entangled with everything around, but can "everything" count as an observer? If the entire system is still isolated, say by being light years away in vacuum - wouldn't the cat be in superposition of being dead and alive for at least that long? The cat is not dead AND alive. The cat is dead OR alive but you don't know which one as long as you don't observe it. The superposition only expresses this trivial fact that the only statement you may make about the cat is that it is dead with a probability x or alive with a probability y. And the quantum mechanics tells you what x and y are and how they combine in the superposition (e.g linear combination) of the 2 possible states |dead> and |alive>. Another example of a large-scale quantum effect is superfluidity in the core of some neutron stars. The temperature is very hot and the size is measured in hundreds of meters. I am in the very uncomfortable position of a layman disagreeing slightly with an expert although I think it is more a matter of emphasis than substance: ""Quantization doesn’t necessarily imply discreteness." I understand what you are saying but think one could just as well (or better) say:"Quantization implies discreteness, but not all physical quantities have been found to be discrete at levels we can observe (so far)." To me the first fundamental insight of quantum mechanics was that at least some physical quantities which had been considered to be continuous were discrete. "The position of electrons in the conducting band of a metal for example is not discrete – the electron can occupy any place within the band. And the energy values of the photons that make up electromagnetic waves are not discrete either. For this reason, quantizing gravity – should we finally succeed at it – also does not necessarily mean that space and time have to be made discrete." The first use of "is not" seems to be in contradiction with the final "does not necessarily". That is, how can one be positive that the positions of electrons is not discrete without knowing for sure that space and time are not discrete? Whether or not there are physical quantities which are not discrete (at some very small level), as long as we calculate them using digital computers, and report them using a finite number of digits, they might as well be discrete, it seems to me. Your #10 dodges the spirit of Schrodinger's thought experiment, which is that isolation of the box from its environment is possible in principle (not in practice). The resolution of the concern raised by Schrodinger ultimately depends on one's interpretation of QM. Isn't superconductivity a macroscopic quantum phenomenon? And for that matter, the laser? Your intuitions are right. It is well known that decoherence alone cannot solve the measurement problem of how a system ends up in a definite final state. Sabine's essential 10 is wrong. Could u please censor incomprehensible, 100% off-topic postings like the last one of uncle? It would save time to your followers. the statement that "Everything obeys the same laws of quantum mechanics" is misleading because entities such as atoms and molecules and biological entities obey other laws as well and the behaviors that can be experimentally observed (i.e. those behaviors that are part of physics rather than of metaphysics) are attributable solely to these other laws, which while not in contradiction to the laws of quantum mechanics, are not related to quantum mechanics, make no reference to them and are not derivable from them. this is one (of the many) problems with those who claim that they work in so-called in FUNDAMENTAL physics, thereby implicitly dismissing other subfields of physics as being less fundamental (e.g. emergent phenomena which are as fundamental as are quarks or even space-time itself. "The ability to reduce everything to simple fundamental laws does not imply the ability to start from those laws and reconstruct the universe. At each new level of complexity entirely new properties appear. The understanding of the new behaviors requires research which is as fundamental in its nature as any other. It requires entirely new laws, concepts and generalizations that necessitate inspiration and creativity to just as great a degree as in the less complex one." Could you elaborate on how decoherence relates to the measurement problem in QM and the challenge of finding a philosphical interpretation in QM of what happens when, for example, an electron describe by a wavefunction is then measured as a discrete particle at a well defined position? To say the obvious, if the cat was in vacuum it would almost certainly be dead. In any case, there is, to my best knowledge, no limit in principle to the mass of objects that you can bring into superpositions, it's really a limit in practice, due to the inability of avoiding decoherence. What you say would be a hidden variables interpretation and these variables would have to be non-local. It's possible in some interpretations but definitely not the standard interpretation. The technical version of the statement I was trying to get across is that the spectrum of operators generically has a discrete and a continuous part. This has nothing to do with measurement accuracy, it is perfectly possible in quantum mechanics for observable quantities to take on continuous values. As to your first point, I didn't say decoherence solves the measurement problem - everybody agrees that it doesn't (or at least they should agree). What decoherence does for you is to explain why we never observe superpositions. This is what I said. Then you can go down the list of interpretations to see if there is actually something left in need of being explained here, I suppose some people would disagree, but as I said I tend to agree. And, yes, there's the problem with the pointer basis and so on and so forth. Again that's a different issue. I have tried to told you this several times before but you seem to have a really hard time getting this: The purpose of my writing here is not to provide technically detailed and accurate summaries - you can look these up in a textbook. The purpose of my writing is to convey knowledge to those who don't have enough background to understand the equations. If that's not what you want to read, don't read it. As to your second point, as you should have noticed by now, I accept and block comments as I please. In contrast to you, Uncle has understood very quickly that one of the main reason I block certain commenters is that they aren't willing to think about my replies and go on to clog the comment sections by repeating their misconceptions. I have no patience for that. To our best current knowledge this picture by Anderson, Nobelprize or not, is not realized in the laws of nature, at least not in our universe. For all we know today, the universe is reductionist and large-scale laws emerge from the small-scale laws, like that or not. This is supported by everything we have learned about nature and there isn't any known exception. There is no known example in which the laws of a course-grained system do not - in principle - follow from the underlying laws. Just try to find one. The best shot I know of is this one. Seeing that there is absolutely no example for how this could possibly come about, I have to conclude it can't happen. In the Copenhagen interpretation decoherence doesn't actually solve the measurement problem for the reason you point out - it gives you a mixed state, but it doesn't tell you what it actually is that you measure, merely the probability for it. Whether you consider that a problem or not depends on what you think the wave-function describes. If you are fine with it merely encoding our knowledge, then that's really all there is to say. Personally I find this unsatisfactory. "in principle". what does that mean? shouldn't it be "in principle, but not (yet) actually achieved"? humans are are part of the universe. other than the (quackish - or maybe he's just having fun?) works of Tegmark, name one case where the laws of human behavior can be expressed in terms of quantum mechanics. or where the laws of the behavior of entangled polymer chains systems (my own field) has been or can be expressed in terms of quantum mechanical concepts. or where consciousness can be explained in terms of quantum mechanics. there are endless laws of nature that have not in fact been expressed in terms of quantum mechanics and in which the introduction of quantum mechanical concepts or entities in any way improves the description of, or predictive ability of the laws expressed in non-quantum mechanical terms. even in the case where of cognition where there is an ongoing effort to use quantum mechanics to explain decision making (see the work of jerome busemeyer) it is not reductionist; it is simply the use of the mathematical apparatus of quantum mechanics. stephen wolfram has written that atoms and particles are MERE epiphenomena of space-time but that's an empty statement. physics is not metaphysics. we use concepts because they are USEFUL in explaining, predicting, doing. the use of theoretical concepts that are not helpful in this regard violates the law of parsimony and IMO not the proper goal of theory. Thanks for your very helpful comment re decoherence solving the measurement problem. I have often seen it touted as the solution, but have never really seen how. What is your personal preference in terms of a solution to the measurement issue and the "collapse of the wavefunction"? Nobody denies that the useful concepts on large scales are not generally the same as those of small scales. This is all a question of "in principle" not "in practice". When I said "everything is quantum" I was referring to this "in principle", as I hope I made clear when I explained that in many circumstances we don't observe these quantum properties. The relevant point is, as I said, there isn't any known way - by which I mean a mathematically consistent theory - to avoid this. Show me a single example, show me any theory or model, in which you can avoid that the coarse grained laws do not follow from the fundamental laws. There is, to my best knowledge, no way to do it*. In this situation saying that it can happen somehow is merely waving hands and yelling "magic". *I actually believe it is possible to avoid it, but it's not a published argument, so fapp it doesn't exist. I usually try to avoid adding my own speculations because I don't want to unnecessarily confuse readers, but since you ask... Let me put ahead though that this is not any accepted interpretation and not even (I have to admit) very coherent. Personally, I think that the collapse should be dynamical, ie that the Schrodinger equation is just incomplete and the full evolution is not unitary. I'm in favor of non-local hidden variables (non-local or acausal, actually I prefer acausal), and I honestly don't understand why this option receives so little attention. There seem to me to exist very obvious experiments that one can make to test for this idea - it's just that nobody has done them. That, I have to add, is a general issue I have with the foundations of quantum mechanics - why isn't there anything like "quantum foundations phenomenology"? I don't really care what you want to interpret an equation. I want to know how you can experimentally go beyond what we have now. Anyway, it's a topic I find very interesting but that's basically impossible to get funding for. Thus I don't work on it. (Or shouldn't.) I am adding this because I'm somewhat sick and tired of people who believe that scientists are free to work on what they are interested in. It's clearly not the case.
" I explained that in many circumstances we don't observe these quantum properties." my position is that if you don't observe quantum mechanical properties, then they effectively don't exist. i'm not even sure what 'quantum mechanical properties' mean. if the properties of a system can be described using mathematics of quantum mechanics (as in the work on human decision making i mentioned) does that mean the system is 'quantum mechanical' in nature? Professor Sir Sam Edwards used the mathematics of path integrals and Feynman diagrams to describe the behavior of polymer chains but that doesn't mean that polymer chains show quantum mechanical behavior. there's a lot of discussion of why mathematics is 'the language of nature' (see FQXi) but almost no discussion of what it means when the same mathematics can be used in disparate systems. this is related to the question of whether mathematics is the instantiation of reality. "What decoherence does for you is to explain why we never observe superpositions." No it does not. It only explains why there is negligible interference between the dead and alive component of the superposed cat. If one chooses to explain why we never observe superpositions with the many worlds interpretation, decoherence solves a problem that this interpretation would otherwise have. That's all decoherence achieves. Sabine, I do realize that you're trying to write in an accessible style. But accessibility is no excuse for making statements that are plainly wrong. I just disagree with a few (not many points); if you think about it you must conclude that the world is not only described by quantum mechanics, but that an extension and change of the Copenhagen rules is needed in order to accomodate democratically for the observer. Whether or not these rules are classical to some extend is unknown but there is certainly no proof whatsoever that large objects behave effectively classically starting from conventional quantum mechanics. The second disagreement concerns your statement that information cannot travel faster than light in QFT and that such thing would be in violation of special relativity. The last is certainly not true, one can uphold the weaker principle that information cannot travel directly to the relativistic past which is in a sense the very definition of the Feynman propagator. Now, the first assertion is kind of loosely formulated as it is never said what information actually is. I prefer spacelike commutativity but all that says is that the outcome of two experiments which are performed in spacelike separated regions only depends upon the local values of the measurements. Given that correlations can travel outside the lightcone (the Feynman propagator is nonzero there), one has to be careful what one means since the information about the creation of a particle at a spacetime point certainly travels outside its lightcone. There is still another version of quantum causality which has nothing to do with operators and which says that the amplitude for propagation of a particle from x to y is indistinguishable (possibly up to a sign) from the amplitude of the propagation of an antiparticle from y to x if x and y are spacelike separated. Here, one explicitely acknowledges that some information travels outside the lightcone but no harm is done. Yes, what I mean by "quantum mechanical" is "described by quantum mechanics". Discussions about what "exists" or doesn't exist are entirely superfluos for this. Yes, polymer chains are of course quantum mechanical. I have no idea what you mean by mathematics being the "instantiation of reality". I'm an instrumentalist. Math is a language and it works very well. We have shitloads of evidence that it works dramatically well. If you want to argue that there are systems which are exempt from being described by mathematics that's a big claim - a very big claim. And as they say, big claims require big evidence. So where's the evidence? There is none. Look, all I am saying is that according to our best present knowledge, there isn't any such case. I'm not saying it's not possible, I am saying there isn't a single example in existence and there is no evidence and the only scientific conclusion that one can draw from this is that it is for all we presently know not possible. I agree with your first point. About the second point: I am only referring to measurable entities. Decoherence reduces the off-diagonal elements in the density matrix to an unmeasurably small number, which amounts to saying that we don't observe superpositions of the state being measured in the pointer basis. Those who know how decoherence works don't need your comment. And those who don't know won't find your comments useful either. Consequently, the only reason I can see for your comments is, once again, that you want to convince us you know something about quantum mechanics. Tell you what: nobody cares. Your complaints about my writing are merely wasting my time and also the time of our readers. "Yes, polymer chains are of course quantum mechanical." so i guess you think EVERYTHING is quantum mechanical, even though their description makes no use of quantum mechanical concepts or entities. does this also apply to consciousness (the mind, not the brain)? Indeed, as I wrote in the above blogpost, first point "Everything is quantum". If the description of a system makes no use of quantum mechanics that's because it's an approximation. This applies to everything physical. I don't know what "consciousness" is. according to IIT (https://medium.com/the-physics-arxiv-blog/why-physicists-are-saying-consciousness-is-a-state-of-matter-like-a-solid-a-liquid-or-a-gas-5e7ed624986d#.6ehjm1i3t), consciousness is... well, the IIT definition of consciousness is totally arbitrary and Tegmark's calculation of it is the sort of pseudo-scientific babbling you might expect form a tenured professor who can get away with publishing such nonsense (they call it speculation). do you at least accept that consciousness is 'something' even if we can't say what that something is? sorry to stray from physics but i'm interested in your view. after all, you spend some of your time studying things that can't be experimentally falsified (no offense intended) and consciousness seems to fit into that category. I commented on Tegmark's paper here. As you'll note I wasn't really convinced, but roughly speaking I think that this line of inquiry deserves more attention. I don't know what you think that I study that can't be experimentally falsified. Thanks for your reply. It makes sense to me if I summarize it correctly as follows: your statements refer to models of reality but not reality itself. So in the QM model there are things modeled as discrete and things modeled as continuous; and in the atomic lattice model electron position is modeled as continuous, although it may turn out (in the quantum gravity model which we do not yet have) that positions are in fact discrete. It wasn't until a graduate course in numerical analysis that I learned there are finite-difference equations for discrete systems which are similar to differential equations for continuous systems (and solved by similar methods with similar forms of solutions) so that, as far as I know, in the limit of small-enough increments, there is not necessarily a noticeable distinction between a discrete and continuous model - although at larger increment sizes there can be. So in my model of reality (which of course is not the same as reality), continuous systems are useful approximations to what are probably discrete systems with very fine increments, since as the ancient Greeks speculated we find more and more things are discrete (matter->atoms/sub-atomic particles; electro-magnetic radiation->photons) as we gain the ability to measure them. Thank you for responding! "The purpose of my writing is to convey knowledge to those who don't have enough background to understand the equations." I appreciate it since I am one of those people. I do understand the interpretations are very different about what decoherence phenomenology is (the wikipedia does a great job explaining it). But leaves me still wondering the role of information in decoherence. If the box is filled with air (and no decompression or any interaction occurs long enough) will cat's decoherence result in pure state (if understand it correctly as negligible off-diagonal values in density matrix)? My impression that in original Copenhagen interpretation that would happen before any observation, even if the cat is just one atom. The interaction with the box is enough for decoherence. However, what constitutes measurement/observation is still a mistery for me. If no information even gets out the box - will decoherence be enough to reduce off-diagonal values. Or will the "box" an the "cat" be entangled in a new superposition (joined waive function) until information gets out of the box (something about quantum factorization tracing over the environment component that I read in here http://motls.blogspot.com/2016/04/backreaction-mostly-right-on-quantum.html)? So sounds like the system must be at least open and decoherence is similar to dissipation in irreversibility respect. Does that mean that any isolated system will remain in superposition? Please help me understand. Schrödinger’s cat was a story created by Schrödinger to show how ridiculous QM was (and is). He would not be happy knowing that his cat story is now used to demonstrate QM. Sabine's modern take on the problem - decoherence - is not a defence for the measurement problem, its a head in the sand position. QM is linear and there is also no limit to the number of dimensions in Hilbert space. So coherence is a scale free feature of QM. Newton's gravity - while being accurate enough to be used by NASA to guide planetary probes - has the huge conceptual hole of instantaneous action at a distance. Newton was well aware of this - but it took hundreds of years for Einstein to offer a solution. The measurement problem in QM is not going to go away until QM is found (like every other 'old' theory) to be an approximation of some next theory. Hossenfelder got 7 "totally correct" ratings, 3 "ambiguous" ones, and no "completely wrong" ones. This is better than what 90% of the people calling themselves "researchers in the quantum foundations" could ever achieve. ;-)"
I don't know if someone has mentioned this article to you before but this shows we can put things into super positions that are big enough for us to observe under a microscope. I would love to see what it does when they do this, sit still, or move, or some how both. You fail to understand what decoherence is even good for. Also, you are putting words into my mouth I didn't use - I never said, not here and not elsewhere, that decoherence solves the measurement problem. You got that basically right. Decoherence comes about because the system that you want to observe (say, the cat), becomes entangled with some other system (the air, the box, the measurement apparatus) - which you can generally think of as the environment. "Tracing out" essentially means you discard the information in the second system (on the rationale that you don't know it). This leaves you with a probabilistic state for the cat, but one in which the cat is now either dead or alive, no longer both. The full system (cat and environment) always remains in a pure state (if it started in one - if not you can complete it). Think of this as the full quantum state. So decoherence is something that explains why, in practice, we never observe quantum superpositions - they fade away very quickly, especially for large states. Thus, the absurdity that Schroedinger meant to point out with his cat example doesn't actually exist. The decoherence interpretation makes most sense if you think of the wavefunction of encoding information. It is not so really helpful if you think of the wavefunction as the "thing" that is real, as opposed to just describing something about reality. The problem is that decoherence still leaves you with the probabilistic (mixed) state, rather than one particular measurement outcome. Hence, many regard it somewhat unsatisfactory. One thing I should add - there is one exception to what I said that the full system always remains in a pure state if it started in one, and that are black holes. If the environment contains a black hole, any part of the wavefunction that vanishes behind the horizon is ultimately destroyed in the singularity, converting a pure state into a mixed state not because you willingly discard information, but because it's indeed gone. Such a thing can't happen in quantum mechanics, thus it creates the information paradox. Whether or not nature is fundamentally 'really' continuous or whether that's just a good approximation nobody knows. When I say that quantum mechanics has continuous observables I am referring to the theories which we currently have, which do, in particular, treat space and time as continuous. There is actually a lot of discussion about the point which you raise, whether a continuum that requires infinitesimally (and hence, unmeasurably) small distances actually makes physical sense. As you said, I subscribe to an intstrumentalist take on the laws of nature, I don't really care much about what is "real" but just whether it's a good description. Trying to approximate a continuum with discrete steps becomes much more difficult once you take into account Lorentz-invariance. It then is very difficult to avoid that the finiteness of steps leaves large residuals. That's because Lorentz-invariance (think Lorentz-contraction, or its inverse respectively) can convert very small distances into very large ones and vice versa. Could you elaborate (even) more on your last paragraph concerning the exact tension between Lorentz invariance and attempts for discretisation ? The notion that interactions with the environment prevent the observation of superpositions seems simple enough at first glance. Except I'm fuzzy on where this "environment" comes from. The universe began as some sort of object so small it was surely a quantum state of some sort. It's hard to see why it wouldn't be a superposition. Without an environment to interact with, how do the great cosmic superpositions resolve? I suppose you could hypothesize they don't, but that we only see a part of the cosmic all, a part with a consistent history. But this seems like the multiverse to me. And I'm not at all sure that all people who aren't Sean Carroll think QM is the multiverse. Given chiral composite object diffraction, what interacts at the grating? Diffracted (Schrödinger's cat configuration) single enantiomer camphor may racemize. Diffraction racemization of a multiply-connected stabilomer (thermodynamic deep hole in the energy hypersurface) chiral cage with many rotational symmetries is a stronger test. Look, then theorize. Physics excludes ground state geometric chirality, then curve fits. "The problem is that decoherence still leaves you with the probabilistic (mixed) state, rather than one particular measurement outcome." Why is that a problem? The observer's brain is part of the overall quantum system, and its state gets entangled with the state of what is being measured, so you only get brain states that perceive one particular measurement outcome. Or are you referring to the problem of where the Born rule comes from? What do you think of Sebens' and Caroll's proposed resolution ("Self-Locating Uncertainty and the Origin of Probability in Everettian Quantum Mechanics", http://arxiv.org/abs/1405.7577). Hi Sabine, your answer depends upon how one defines measurable questions. For example, in QFT axiomatics one would postulate that the only admissible questions are those who commute at spacelike distances; one proceeds then to verify that for Bosonic particles the field operator satisfies this demand while for Fermionic particles one has to take some square of the field operators due to the anticommutation relations. Fact of the matter is that causality in this sense is nowhere derived, it is merely input. For instance the ''canonical projection operators''P(x) = x> = phi(x) 0> (one can make this rigorous by smearing x in a spacetime region) are excluded in such interpretation as representing real experiments since P(x)P(y) is not equal to P(y)P(x) for x spacelike separated to y. Hence, you have to declare that the propagator < y ,x > = <0 phi(y)phi(x) 0> is not an observable amplitude (in either that its modulus squared is not an observable). My opinion is different and I think interpreting the field as an operator for measurement has many problems associated to it and moreover, it is perfectly fine to set up a consistent probability interpretation in which the commutativity constraint is not important at all and particles can be sharply measured at spacetime positions. Frank Wilczek just wrote an article @ Quanta, "Entanglement Made Simple"
although 'simple" depends on your point of view, I suppose! As a non-professional physicist, I was astonished by Wilczek's description of the GHZ effect. The world is stranger than we (most of us, anyway!) can imagine.